A class is a single item. Like a builtobject or a function. They are depicted using a rectangle. 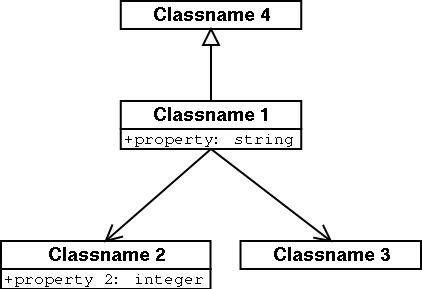 If there are any attributes (that is, some internal information for that class), an extra box is drawn in the rectangle and the attribute information is placed in the second box. A class door can have the attribute language="english". A line from one class to another indicates a relationship, For example, a quantification has both an amount and a unit. A line with a triangle at it's end indicates an inheritance relation, the attributes and other characteristics of the item having the triangle next to it are inherited by the item on the other end of the line.